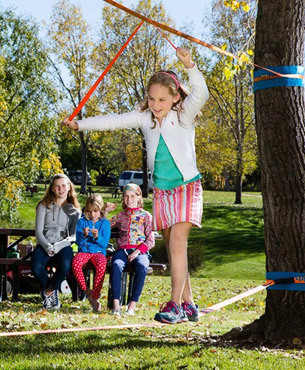 The Playline is dedicated to slacklining beginners, both kids and adults – it’s designed to minimize the line moving and the webbing uses a rubber grip to keep the feet from slipping. It also includes a help line which you stretch above the main one and use it as a guide to assist with balance (see the pictures). And at the same time it teaches you the right slacklining posture with elevated arms (the natural beginner’s tendency is to keep them lower) – a nice idea! 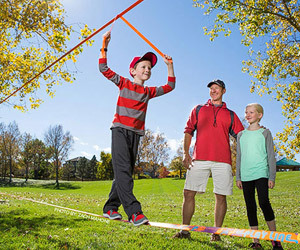 Slackline industries recommends it for kids older than 5 years, but people report that even younger children enjoy it. And it’s great for birthday parties! The ratchet has a comfortable plastic grip and also a rubberized release – releasing the tension is safe and quite easy. Also, an instructional DVD and tree protection pads are included. 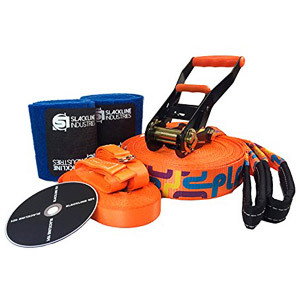 As this slackline is designed mainly for kids, the safety has to be on a high level – the material is sturdy and durable and ratchet is equipped with a safety lock. Also the line is meant to be mounted close to the ground so there is almost no risk of injury because of falling. 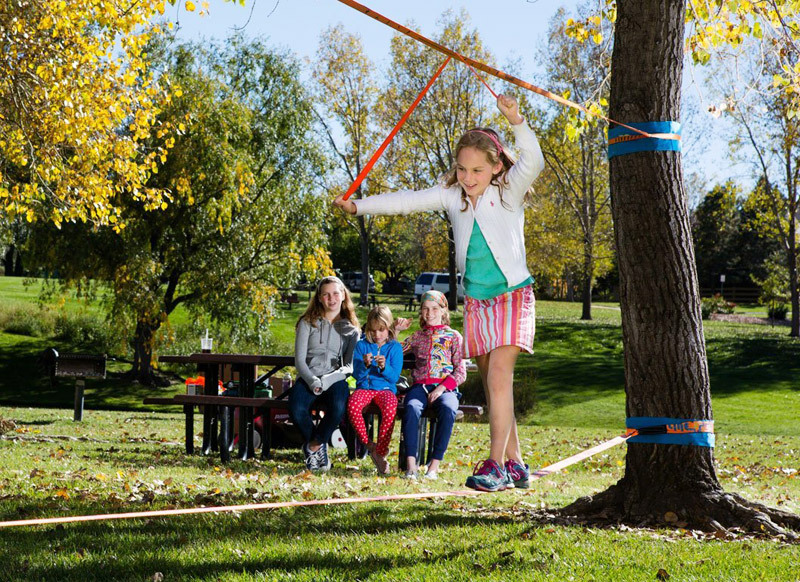 Conclusion: If you are searching for a slackline for your kids, look no further – the Play line is exactly what you need. Safe, not too bouncy and easy to walk on. 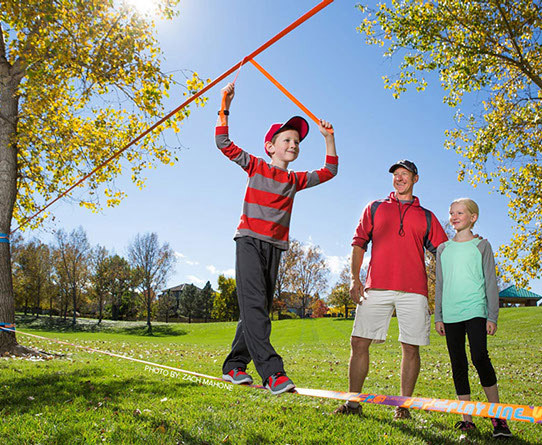 However, for teenagers and adults who want to start slacklining, we would recommend considering also the Baseline. It is great for learning as well, but much better for tricks and jumps. 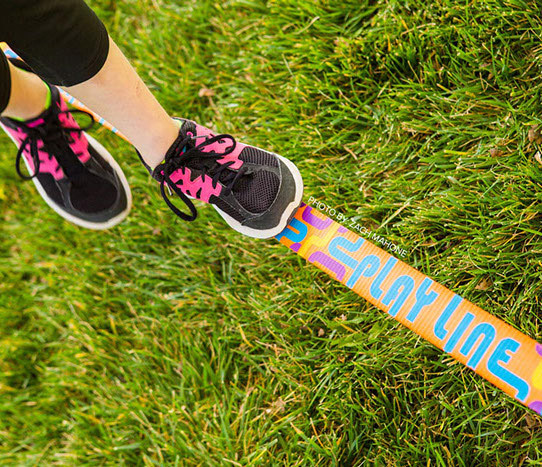 For kids – should I buy the Playline or Baseline? 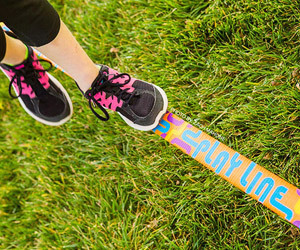 For beginners – should I buy the Play line or Baseline?